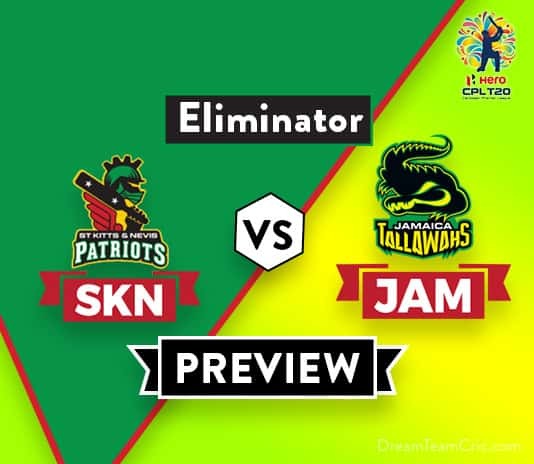 Hello and Welcome to our preview for St Kitts Nevis Patriots vs Jamaica Tallawahs Eliminator match. 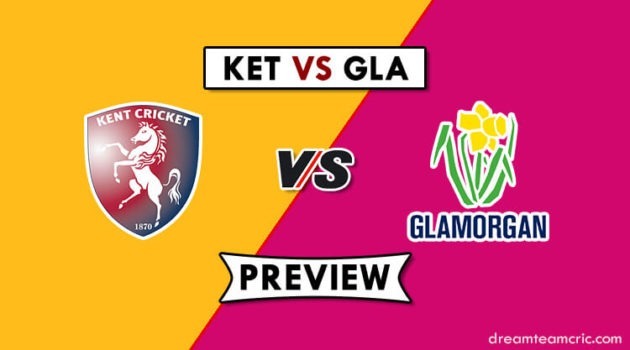 We are covering SKN vs JAM Dream 11 Team Prediction, Preview and Probable Playing XI for the CPL T20 match. The match is to be played at the Providence Stadium, Guyana. The group stages of the CPL 2018 are over and we are into the final three games now. This will be the Eliminator match where the winner will advance to Qualifier 2 while the loser will go home. Winning team will face one of TKR or GAW. St Kitts Nevis Patriots were fourth placed in the group stage. They were victorious five times while lost four matches, one match was abandoned due to rain. They have managed to stitch together two consecutive wins before coming into this encounter which includes a seven-wicket win over Jamaica in the rain-curtailed match. Jamaica Tallawahs have been hot and cold. Their captain Andre Russell has played a few miraculous knocks to take the team home while at times they have failed to get him on the crease. Coming into this match, JT defeated Guyana by 8 wickets and registered a thumping win. They will be confident going into this match. Chris Gayle (c), Devon Thomas (wk), Carlos Brathwaite, Ben Cutting, Evin Lewis, Ibrahim Khaleel, Anton Devcich, Sheldon Cottrell, Rassie van der Dussen , Fabian Allen, Brandon King, Tabraiz Shamsi, Alzarri Joseph, Shamarh Brooks, Jeremiah Louis, Javelle Glen, Hayden Walsh. Both Mahmudullah and Tom Cooper have left CPL so they will not play todays game. T Shamsi replaced Tom Cooper who is returning to Australia for the start of their domestic season. While The Bangladesh all rounder has to return to Bangladesh squad for Asia Cup. Saad Bin Zafar, Canada’s team allrounder is added as cover of Mahmudullah and he is expected to play today in place of Mahmudullah. Patriots had three changes in their last match as they trialed few players. Ibrahim Khaleel, J Louis and Tabrez Shamsi played while Devon Thomas, C Brathwaite and S Cottrell were rested. T Shamsi will retain his place in the team while Louis and Khaleel will be dropped. Tallawahs made four changes in their last match. They included Ross Taylor, Ish Sodhi, Steven Jacobs and Samuel Badree. Sodhi replaced Zampa who had to return to Australia. Other dropped players were Kannar Lewis, Steven Taylor and K Santokie. Tallawahs are likely to field the same playing XI. Chris Gayle (c), Evin Lewis, Rassie van der Dussen, Devon Thomas (wk), Anton Devcich, Ben Cutting, Fabian Allen, Saad Bin Zafar, C Brathwaite, Tabraiz Shamsi, S Cottrell. Glenn Phillips (wk), Johnson Charles, Ross Taylor, Rovman Powell, David Miller, Andre Russell (c), Colin de Grandhomme, Ish Sodhi, Steven Jacobs/K Roach, Samuel Badree, Oshane Thomas. Captain and Vice-captain choice: G Phillips, R Powell, A Russell, E Lewis, J Charles. 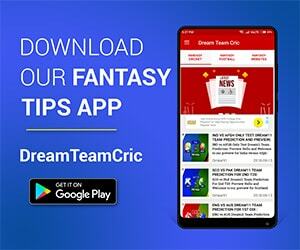 If you liked SKN vs JAM Dream 11 preview, then follow us on Twitter for Latest Cricket News.